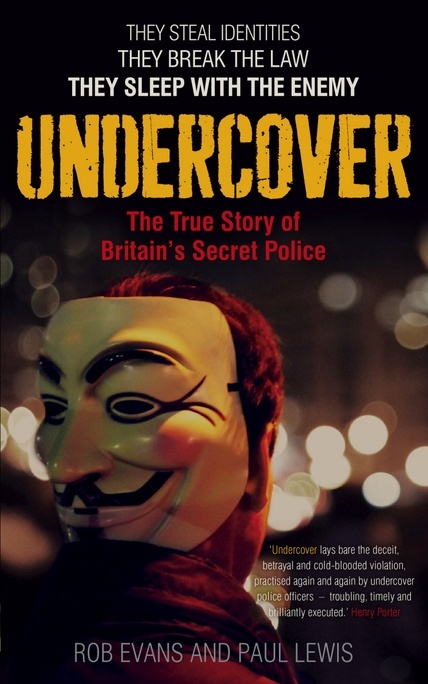 This study of police spies who infiltrated radical movements in the UK originated in a series of reports that Rob Evans and Paul Lewis wrote for the Guardian. However, as the cover of the book indicates (“They steal identities. They break the law. They sleep with the enemy”) the journalistic approach here bears more of a resemblance to that of the tabloid press, where balanced analysis is rejected in favour of generating shock-horror headlines. A major source for Evans and Lewis’s revelations is a former police spy named Peter Francis, who infiltrated the anti-racist movement during the 1990s under the alias of Pete Black, but now repudiates those activities and has decided to spill the beans on his former colleagues. Understandably, media coverage of the book has concentrated on Francis’s shocking claim that he was ordered to report back rumours about the family of murdered black teenager Stephen Lawrence that could help the police smear them and discredit their campaign. Whatever the accuracy of this charge – and call me an old sceptic, but I smell publicity-seeking exaggeration here – it has deflected attention from the fact that Francis’s central task was to gather intelligence on Youth Against Racism in Europe (YRE), which was a front organisation for Militant. As anyone familiar with that political tendency will know, it has consistently supported a parliamentary road to socialism and has never advocated violence. For the state to subject groups like this to intrusive surveillance is not only an attack on the democratic right to peaceful political organisation, as the authors of Undercover rightly argue, it is also a considerable waste of police resources and public money. Another spy whose activities are examined in detail in Undercover is Bob Lambert, who is transformed into something of a pantomime villain in this shallow and rather melodramatic account. (Indeed, so malicious and unbalanced is the authors’ treatment of Lambert that you do wonder whether they have some unstated ideological axe to grind.) During 1984-88 Lambert operated as an activist inside London Greenpeace, an organisation of a broadly libertarian-pacifist character that was committed to non-violent protest and posed no more of a threat to the public than YRE did. Lambert, however, has insisted that the purpose of his activity in London Greenpeace was not to spy on that organisation as such but rather to provide himself with a credible background as a radical campaigner in order to penetrate the Animal Liberation Front (ALF). This was an objective that he successfully accomplished, and as a result of his work two of the ALF’s key figures were arrested and received substantial prison sentences for their part in an arson campaign. The ALF was a loose network of militants who pursued their cause through such tactics as planting incendiary devices in shops that were selling fur, while more extreme elements who were part of the same milieu sent letter bombs to politicians and attacked individuals working in animal research laboratories. Unlike YRE or London Greenpeace, this wing of the animal rights movement did pose a serious threat and nobody can doubt that something had to be done about it. Lambert’s work as a police agent therefore achieved an admirable result (the breaking up of a cell of firebombers), but by reprehensible means (the infiltration of a group of peaceful protestors). The obvious question, which Undercover fails to address, is how can the state legitimately counter outfits that promote and engage in violent criminality or terrorism? Lambert himself developed an alternative model for such counter-extremist work when he established the Muslim Contact Unit (MCU) as part of the Metropolitan Police Special Branch in 2002. As he shows in his book Countering Al-Qaeda in London: Police and Muslims in Partnership, he adopted an entirely different method from the one he had implemented in the 1980s. Instead of organising the infiltration of Muslim groups, Lambert openly approached them in order to enlist their co-operation in combating violent extremists within the Muslim community. The ousting of Abu Hamza’s supporters from Finsbury Park Mosque in 2005 was the most notable success for Lambert’s strategy, and the MCU also worked constructively with the leadership of Brixton Mosque who were resisting the influence of Al Qaeda sympathisers among Muslim youth. Obsessed with their demonisation of Lambert, the authors of Undercover give him no credit at all for these achievements. Rather, they assert that the MCU was only “ostensibly” designed to build relations with Islamic groups, and they suggest that in reality it may well have served as “a front for a more sinister intelligence-gathering exercise”. No evidence whatsoever is offered to substantiate this accusation. The strategy pursued by Lambert and the MCU proved highly controversial, involving as it did co-operation with Muslim Brotherhood supporters and ultra-conservative Salafis. Some senior officers were critical of the MCU’s work with people they categorised as domestic extremists. The MCU also came under public attack from the neocon think-tank Policy Exchange, who accused Lambert and his colleagues of appeasing Islamists. The MCU was further isolated after 2006 when the then Labour government bought the argument that peaceful proponents of political Islam should be cold-shouldered because they opened the door to violent extremists – a stupid and ignorant analysis that resulted in the government breaking links with the mainstream Muslim Council of Britain in order to push forward the minuscule, entirely unrepresentative and now thankfully defunct Sufi Muslim Council. Lambert retired from the police force in 2007 and subsequently played a prominent role in resisting the rising tide of often violent bigotry directed against the Muslim community, while using his standing as an expert in counter-terrorism to urge the government and security services to devote more attention to combating the growing threat from the far right – much to the displeasure of the likes of Andrew Gilligan. Unfortunately, although Lambert retains his post as lecturer in Terrorism Studies at the University of St Andrews, this excellent work has been seriously undermined as a result of Evans and Lewis’s campaign against him. Evans and Lewis are evidently very pleased with themselves over their role in destroying this work and effectively driving Lambert out of public life, on the basis of denunciations of his actions as a relatively junior copper over a quarter of a century ago. The far-right thugs responsible for the recent wave of attacks on the Muslim community will no doubt applaud their efforts.